At the first-ever Players Weekend in August 2017, Major League Baseball players wore jerseys with their nicknames on the back. One player — Cleveland Indians shortstop, Francisco Lindor — picked the perfect moniker to express his cheerful, fun-loving nature: “Mr. 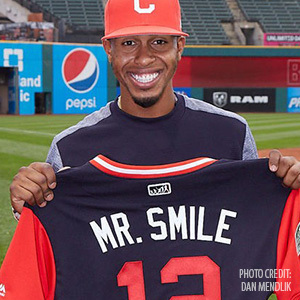 Smile.” And Lindor gave fans plenty to smile about when he belted a 2-run homer into the stands while wearing his new jersey! Routine Professional Cleanings & Exams. This is a great place to start on the road toward a healthy, beautiful smile. Even if you are conscientious about brushing and flossing at home, you won’t be able to remove all of the disease-causing dental plaque that can hide beneath the gum line, especially if it has hardened into tartar, but we can do it easily in the office. Then, after a thorough dental exam, we can identify any problems that may be affecting your ability to smile freely, such as tooth decay, gum disease, or cosmetic dental issues. Cosmetic Dental Treatments. If your oral health is good but your smile is not as bright as you’d like it to be, we can discuss a number of cosmetic dental treatments that can help. These range from conservative procedures such as professional teeth whitening and bonding to more dramatic procedures like porcelain veneers or crowns. Tooth Replacement. Many people hide their smiles because they are embarrassed by a gap from a missing tooth. That’s a shame, because there are several excellent tooth-replacement options in a variety of price ranges. These include partial and full dentures, bridgework, and dental implants. So don’t let a missing tooth stop you from being Mr. (or Ms.) Smile! Michael speaks from experience. As a teenager, his own smile was enhanced through orthodontic treatment. 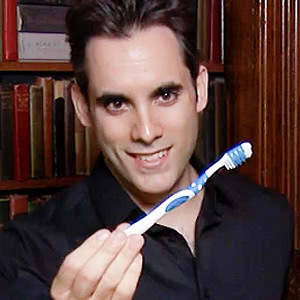 Considering the career path he chose for himself — performing for multitudes both live and on TV — he calls wearing an orthodontic device (braces) to align his crooked teeth “life-changing.” He relies on his welcoming, slightly mischievous smile to welcome audiences and make the initial human connection. Tooth Whitening. Professional whitening in the dental office achieves faster results than doing it yourself at home, but either approach can noticeably brighten your smile. Bonding. A tooth-colored composite resin can be bonded to a tooth to replace missing tooth structure, such a chip. Veneers. This is a hard, thin shell of tooth-colored material bonded to the front surface of a tooth to change its color, shape, size and/or length; mask dental imperfections like stains, cracks, or chips, and compensating for excessive gum tissue. Crowns. Sometimes too much of a tooth is lost due to decay or trauma to support a veneer. Instead, capping it with a natural-looking porcelain crown can achieve the same types of improvements. A crown covers the entire tooth replacing more of its natural structure than a veneer does. Porcelain veneers are positive proof that unattractive teeth don't always require an intensive restoration to regain their beauty. These thin layers of translucent porcelain — custom-designed and color-matched to blend with your other teeth — are permanently bonded to the visible side of your front teeth. Although they can't remedy every tooth defect, they're well suited for mild to moderate disfigurements like chipping, staining or gaps. 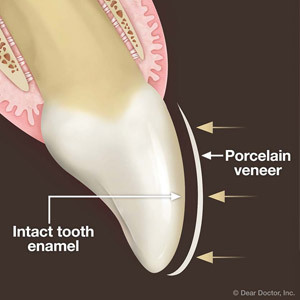 There are now two types of porcelain veneers: the traditional veneer and the “no-prep” veneer. The standard veneers require some tooth structure removal, referred to as “tooth preparation.” This is because although they're a millimeter or less in thickness, they can still appear bulky if bonded to an unprepared tooth. To accommodate their width, it's necessary to remove some of the tooth enamel. This permanently alters the tooth so that it will need some form of restoration from that time on. In recent years, however, other veneer options have emerged that reduces — or even eliminates — this tooth alteration. No-prep veneers are so thin they can be applied to a tooth with virtually no preparation. A more common option, minimal-prep, requires only a minor reshaping with an abrasive tool to ensure the fitted veneer looks as natural as possible. Because of their thinness, these veneers also don't have to fit under the gum line like standard veneers. To obtain no- or minimal-prep veneers, your tooth enamel needs to be in good, healthy shape. They're also best suited for people with small or worn teeth, narrow smiles (the side teeth can't be seen from the front), or slightly stained or misshapen teeth. Because there's little invasiveness, these low preparation veneers won't typically create tooth sensitivity and they can often be applied without any form of anesthesia. And because tooth structure isn't removed, they can be “uninstalled” to return to your natural look. Of course, that's not always an easy process since the bonding between veneer and the enamel is quite strong, although today's lasers can be used to detach the veneer quite easily. If you'd like to consider these minimally invasive veneers, talk with your dentist. If you're a good candidate, you may be able to gain a new smile without much change to your natural teeth. There are a number of cosmetic dental procedures that can give you the smile you want. Procedures such as Invisalign, dental implants, veneers, sealants and teeth whitening can all dramatically improve the appearance of your teeth and your smile. A dentist who specializes in cosmetic dentistry can help you determine which procedures will best suit your needs. At Norwich Aesthetic Dentistry, Dr. Edward Yates, is your Norwich, CT, cosmetic dentistry expert. Invisalign is a modern alternative to traditional metal braces for straightening teeth. Instead of metal brackets and wires, Invisalign uses clear trays made of soft plastic. Since the trays are clear, they are practically invisible. Additionally, unlike metal braces, which are glued or cemented onto the teeth, Invisalign trays are removable. Patients can remove the clear trays when eating to prevent food particles from getting stuck. The trays can also be removed when brushing and flossing, making it easier to thoroughly clean teeth. Dental implants replace missing teeth and their roots. Unlike other tooth replacement options, like dentures, dental implants are permanently affixed in place and will not come loose or slip out of place. There are three parts to a dental implant: implant, abutment and crown. The implant serves as the tooth’s root and is drilled into the jawbone below the gum line. The crown serves as a replacement tooth and sits above the gum line. The abutment joins the two together and is not visible once everything has been installed. Another cosmetic dentistry option in Norwich is a dental sealant. A dental sealant is a clear thin coating that is applied to the surfaces of molars or the back teeth. The sealant functions as a protective cover that prevents food particles from getting stuck in the grooves of teeth, which would ultimately lead to tooth decay. Professional teeth whitening is an excellent method for brightening up teeth that have become dull, discolored or stained. In as little as one or two professional treatments, patients can achieve the desired level of whitening. Further, results can last for several years before additional treatments are needed. There are many cosmetic dentistry procedures available to correct a variety of dental problems. Some patients need just one specific procedure, while others can benefit from undergoing several cosmetic dentistry procedures. Dr. Yates is your cosmetic dentistry expert in Norwich, CT. To schedule an appointment with him, contact Norwich Aesthetic Dentistry at (860) 889-6445. When the multi-platinum recording artist, songwriter and TV personality Jason Derulo was recently asked about his ideal woman, his answer covered a remarkably broad spectrum. "There’s no specific thing," he said, "so I think it’s unfair to say what my ‘type’ is." But it turns out that there is one thing the So You Think You Can Dance judge considers essential: A beautiful smile. "I’m not into messy teeth," Derulo said. "If the grill has spaces and different colors, it’s not my vibe." As it turns out, he may be on to something: A number of surveys have indicated that a bright, healthy smile is often the first thing people notice when meeting someone new. Yet many are reluctant to open up that big grin because they aren’t satisfied with the way their teeth look. If you’re one of them, consider this: Modern cosmetic dentistry offers a variety of ways to improve your smile — and it may be easier and more affordable than you think. For example, if your smile isn’t as bright as you would like it to be, teeth whitening is an effective and economical way to lighten it up. If you opt for in-office treatments, you can expect a lightening effect of up to 10 shades in a single one-hour treatment! Or, you can achieve the same effect in a week or two with a take-home kit we can custom-make for you. Either way, you’ll be safe and comfortable being treated under the supervision of a dental professional — and the results can be expected to last for up to two years, or perhaps more. If your teeth have minor spacing irregularities, small chips or cracks, it may be possible to repair them in a single office visit via cosmetic bonding. In this process, a liquid composite resin is applied to the teeth and cured (hardened) with a special light. This high-tech material, which comes in colors to match your teeth, can be built up in layers and shaped with dental instruments to create a pleasing, natural effect. If your smile needs more than just a touch-up, dental veneers may be the answer. These wafer-thin coverings, placed right on top of your natural teeth, can be made in a variety of shapes and colors — from a natural pearly luster to a brilliant "Hollywood white." Custom-made veneers typically involve the removal of a few millimeters of tooth enamel, making them a permanent — and irreversible — treatment. However, by making teeth look more even, closing up spaces and providing dazzling whiteness, veneers just might give you the smile you’ve always wanted. Which Orthodontic Type is Right for You? Are You a Good Candidate for Braces? How are Your Oral Hygiene Habits? How Often Should I Brush?